“The Land of Dreams” is a gem, a taut mystery with relaxed pacing and access to the very depths of its characters’ souls. Lance Hansen is a Law Enforcement Officer with the U.S. Forest Service in Minnesota’s Superior National Forest. He’s the guy who will fine you for fishing without a license, bust you for camping outside the designated areas, or hunting illegally. Mostly, it’s a quiet job, perfectly suited for Lance’s laid-back demeanor. One summer day, Lance gets a call that somebody is camping in an unauthorized area next to Lake Superior. It’s his first call of the day. He drives his Jeep deep into the woods, then gets out to walk. He finds a brand new running shoe on the path. He picks up the shoe and continues walking. He comes to a giant granite cross, a historical monument, and Lance finds a young naked Norwegian man, covered in blood, wearing one brand new running shoe. They manage to get the shoe back on the man’s bare foot, and he bolts across the path into a thick patch of trees. In a clearing, Lance finds the grisliest murder scene he’s ever encountered. And thus begins “The Land of Dreams.” Lance makes the discovery, but the case is quickly taken over by the FBI. Because the survivor and the decedent are both from Norway, the FBI brings in a noted Norwegian homicide detective to assist with the case. Lance is tasked with picking-up the detective at the Duluth airport. Eirik Nyland is one of Norway’s most revered detectives. He has a quick mind, and reads people in a trice. He gets a good feeling about Lance Hansen, and the two become friends, discussing the case, despite Hansen being removed from the investigation. Hansen is also the de facto town historian. As the FBI’s murder investigation continues, Lance begins to notice similarities with a hundred-plus-year-old missing persons case. Worse still, his unofficial detective work finds evidence that contradicts the FBI’s findings, evidence that could devastate the town as well as his own family. “The Land of Dreams” is beautifully written. The descriptions of the ancient forests, rivers, and Lake Superior itself transported me to this small town: the sites, the smells, the giddy danger of a summer thunderstorm. What I especially liked was the pacing in “The Land of Dreams.” So many mysteries race through their stories, only giving the reader pro forma portraits of the characters and the action. In “The Land of Dreams,” we also get a sense of the area’s history, the generally placid relationships between the mostly Norwegian-American community and the native Ojibway Native Americans, and the close-knit nature of a small town and its people. The narrative matches the more relaxed small town pace. This novel invites comparison to some of John Sandford’s Minnesota-based thrillers—his character, Virgil Flowers, always seems to end up embroiled in small town intrigue—as well as Stieg Larsson’s “Millennium Trilogy.” I mention the Larsson work for two reasons. First, the pacing is similar: patient and rich in detail. Second, of course, is the Scandinavian connection. Larsson’s trilogy was originally written in Swedish; Sundstrøl writes in Norwegian. When a novel is written in a foreign language, the reader is largely at the translator’s mercy. With “The Land of Dreams,” Tiina Nunnally does a splendid job taking Sundstrøl’s writing, and translating it into natural, descriptive English. Where “The Millennium Trilogy” sometimes felt stark and dry (though grammatically correct), Nunnally shows a wonderful command of colloquial English. “The Land of Dreams” is as smooth a read as if it were originally written by a skilled, insightful English-language author. Her work is commendable. 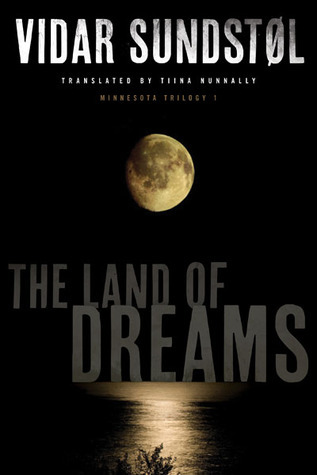 “The Land of Dreams” is book one of what Sundstrøl calls “The Minnesota Trilogy.” He and his wife spent time living along Lake Superior’s northern shore, and he found it to be the perfect location for a mystery. Based on “The Land of Dreams,” I think Sundstrøl nailed it. My only complaint is that I have to wait till Fall 2014 to read book two. “The Land of Dreams” isn’t like what I call the “supermarket thrillers,” those superstar novels crammed onto a display rack alongside razor blades and denture adhesive. It’s one to savor and enjoy, like a good cognac—something real and warm in a generic light beer world.